This weekend was the best. The best. At the beginning of last week, Ian threw out the idea of a last-minute getaway. SOLD. We'd both been stressed with work, and I knew this escape was just what we needed. Charleston, SC has a very special place in both of our hearts ... if you have been there, you know it is just plain good for the soul. We had a really fun and different adventure this time around -- we stayed at a beautiful downtown home that I rented on Airbnb.com. I will definitely be sharing more about this experience! After getting settled into the home, we walked to King Street for our dinner reservations. We had a wonderful dinner at Prohibition (including a truly amazing fresh strawberry mocktail) and then walked down to Virginia's On King where we shared the most delicious slice of key lime pie. We took a cab home that night just due to the chilly temps. The next morning after a bite to eat, we decided to do something that Ian has always wanted to do -- we toured Patriot's Point, where the USS Yorktown is held. Tickets are $18 for adults and it was such a fun and different way to spend the morning -- and because we learned so much, we didn't feel guilty spending the rest of the afternoon just relaxing and shopping! For lunch we headed into Sullivan's Island and had the best sandwiches and chili at Poe's Tavern. 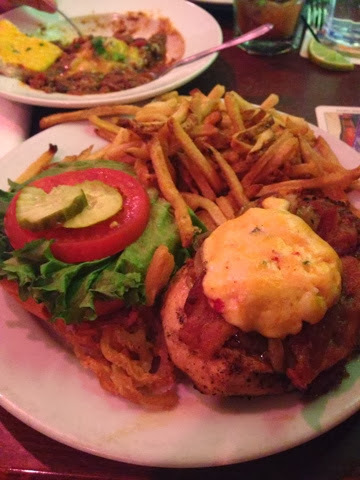 Everyone needs to experience Poe's in their life at some point! After lunch, we shopped all up and down King Street. Ian didn't get anything but he did treat me to the cutest tortoise cuff at C. Wonder. And when we were shopped out, we did something we NEVER do ... we napped! That's right, back to the house we went and we just crashed for about an hour. It was just what we needed. We got ready for the evening and Ian snapped this photo of me in the house -- our host is an artist and this is one of her pieces! That night we had late dinner reservations at Charleston Grill, but we headed downtown early and had a few pre-dinner beverages. By far, the best spot we ended up at was at The Thoroughbred Club right in Charleston Place hotel. We'd been wanting to check out that bar since our last stay at Charleston Place this past September (PS: I was newly pregnant during that wedding, but we kept it a secret, so I sipped on fake cocktails all weekend!). Since we didn't get to go then, we really wanted to make it happen this time around. The bartender made me the yummiest mocktail with cucumber and mint. And dinner that night was nothing short of amazing! Charleston Grill had some of the best service I've experienced in a very long time. We shared an appetizer and had two entrees, two sides, and then declined dessert -- but our adorable waiter still brought out a little sweets sampler for me complete with some chocolates, a macaron, and a praline. Although we will be taking a "real" babymoon shortly, this little mini-babymoon was the perfect getaway! What a perfect weekend! We all need these every once in a while! And I love your dress! I'm so with you, Charleston is on my life's greatest loves. That city and Santa Barbara, CA are the two places I'd move in the US if I had a choice! Sounds like you two had a great time this weekend! Sounds like the perfect trip and exactly what you both needed! So when and where is the big trip?! Exciting! Sounds perfect! Charleston Place, Charelston Grill, and Thoroughbred all hold special memories for us--we went to each one the night we got engaged. And you can never go wrong with Poe's! Sounds like we need to try Prohibition the next time we visit Charleston! Glad you had a great time--can't wait to hear about your next trip! My hubs and I LOVE AirBnB! We took a 2 week trip out west last summer and stayed at 6 different places we booked through their website! It was amazing! I would recommend it to anyone and plan to only use it in the future. 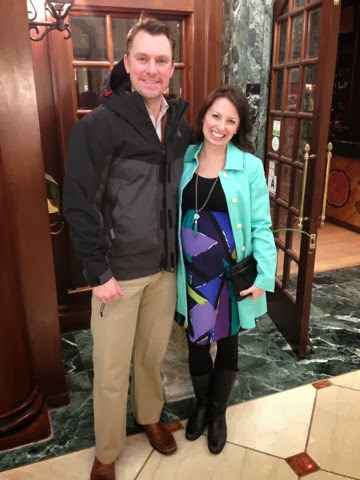 Glad you had such an excellent mini babymoon! This sounds amazing! We're going to Charleston in May for the first time and I can't wait! Any recommendations for our first time as a couple?!? (we've both been before but not together and we haven't stayed in Charleston). What an amazing trip. I have never been to Charleston and I am just DYING to get there! It looks awesome! Also - so funny that you mentioned airbnb.com. We just booked a trip to France (omg!) and my girlfriend told me we should look at apartments in Paris on that website. I'd love to hear what you thought, I'm a little unsure. I'm so glad you had a good time. You look terrific! I can't believe I have yet to make it to Charleston! Your trip sounds amazing and well deserved after a few stressful weeks! Hope yall continue to have a wonderful week! Perfect weekend! Looks like you had a perfect getaway. Charleston holds such a special place in my heart too! It truly is a magical place! Looks like you guys had a great time! You are too cute and I love your coat! I really need to make it to Charleston someday because I've heard so many great things about it. What a perfect pre-baby get away! Thanks for the airbnb tip! "Chuck town" is our go-to getaway too. We've got a weekender coming up and are pretty sure that'll be our destination. ;) patriots point is an awesome little dose of history. Glad you got to experience it!! I love Charleston! What a great weekend away! I heart Poe's! So, where are you thinking for your real babymoon? REmember we did that cruise and it was awesome because we relaxed, slept and ate our faces off! LOL! All that food looks amazing! 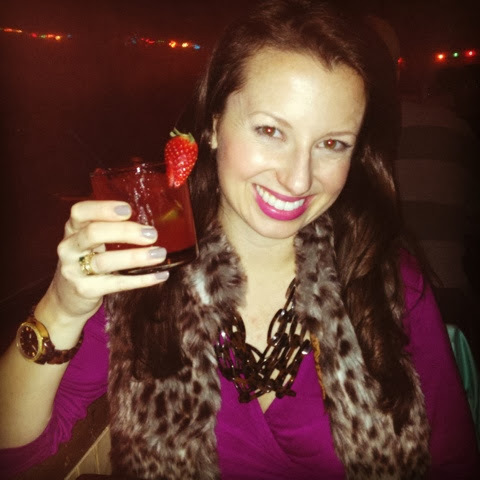 So excited that you recapped this trip - headed to Charleston in March and can't wait to eat at some of these places! Good call on making Poe's a priority. :) Looks like it was the perfect, good eats, relaxing weekend! I need to check out Airbnb for our anniversary trip to Asheville! What a fun way to spend time with just your husband!! Glad y'all got to get away before your baby girl arrives!! 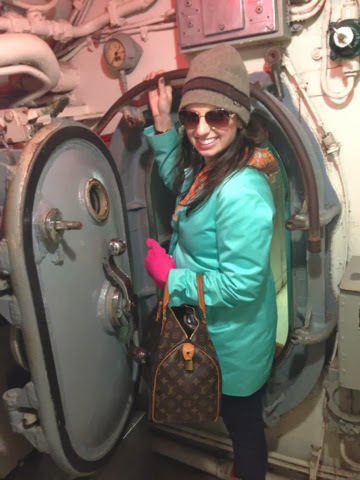 OMG How did you go in that battle ship with a pregnancy nose?! My dad has drug us to every tourable battleship and they smell so bad! I love Charleston, your post has made me want to plan a trip! Looks like the perfect getaway...we are hoping to fit a quick weekend trip in sometime in the next month or so! I love your outfit on the last night! So fun! Charleston is always a favorite in my book. What a fun getaway! Love Charleston, King Street, Poe's Tavern, and the BEACH! Great pictures!! Small world! That pretty marina you took the pic of in Charleston Harbor reminds me of where my uncle used to keep his sailboat. It was always so much fun to see the historic boats when pulling out off of the marina by Lockwood/Broad St. He sold it a few years ago, but it was always fun to go out on it and 'aim for Sumter'! Beautiful little weekend getaway for y'all!